Besides the items I sell in my Etsy store, I offer free design and budget assistance for custom projects. If you have an idea for a special piece, small or large, I can help you by drawing up some plans and offering you a 3D rendering as well as an estimate of final cost. Use the Contact Usform to drop me a line and let’s get started on your project. Learn more HERE. Like and Follow us on Facebook to see my videos on current and upcoming projects as well as insight to the construction process. Welcome! I wanted to take a minute to introduce our team. Mine is essentially a one man operation, but I could not go for one day without Jan’s support, encouragement, and critical eye. 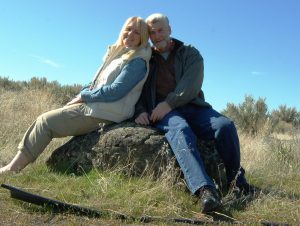 Jan and I married in 2010, both of us having lost our spouses to cancer in the years prior. She is an Indiana native and I was living in Idaho having moved there from my home state of New Jersey in 1994. After living in Idaho for six years we decided to move east and now reside in south central Michigan.